These are the only teaser you’ll ever need to run year round. They will fire up any species to come on the bite from Marlin, Sailfish, Tuna, Mackerel and everything else in between. These are constructed with 400lb Commercial grade Mono that won’t knot and twist like the 200lb mono versions I’ve purchased off eBay before. 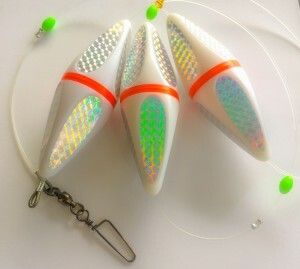 They also have a 350lb Ball Bearing Clip Swivel that you can attach lures and bird teasers to. Every other similar teaser I’ve seen uses 130-200lb clip swivels that aren’t going to last more than 2 seasons. The tow rope is required to set the teaser behind the boat in the prop wash.
It’s 10m so you can set it just the right length so to fish it appears baitfish are getting eaten in a frenzy. This is what drives Pelagic fish wild as they think they are about to miss out on a meal and as they race in and think your lures are an easy feed that’s fallen away from the pack. That’s how teasers work and why these work so well. Even in low light conditions they Splash and Flash and the sonic vibrations from 1000’s of tiny rattles travel for 100’s of metres. The vibrations are similar to that of distressed baitfish and predatory fish switch to feed mode when they hear this because why they know the fish will be easy pickings. Bait Fishing, Bottom Fishing, Live Bait Fishing. Bookmark.